I pack up my tent in the morning as soon as I wake up. The wind rips across the mountaintop. Clouds build overhead. I know rain is coming without checking the weather. There is a log book stuffed in plastic bags and a mailbox on the mountain’s rock cairn. It has the names of everyone who has hiked to the top. I look for anyone heading south on the E1 and find nothing. Loneliness creeps over me as I slide the tent into my pack and stare back at the campsite one last time to check for anything I have forgotten. Then a figure appears on the ridge a few hundred yards away. It stops for a moment then walks towards me. 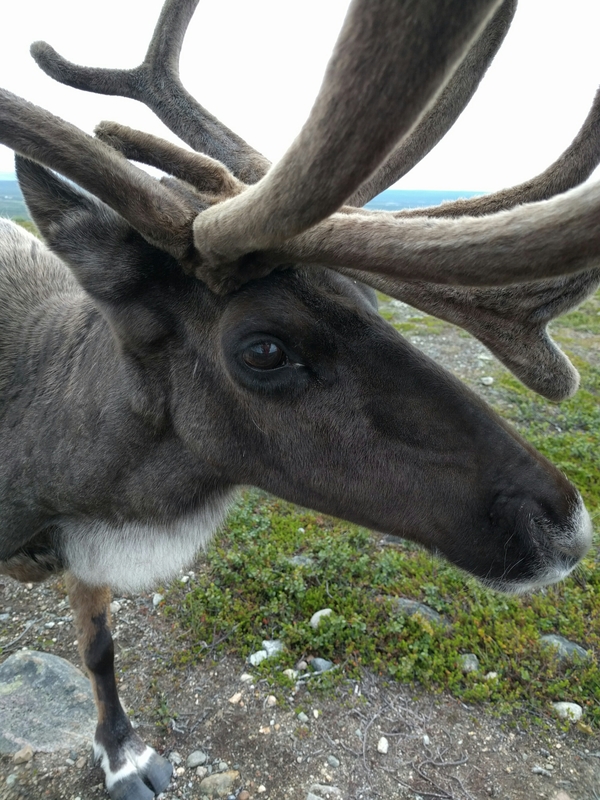 A reindeer. “Theodore Jones!” I holler out to him. I don’t want to be excited to see him. Deep down I know he should go home before he gets too far away to find it again. I know eventually I’ll cross some fence or climb some rock he won’t be able to follow me over. But it would be a lie to say I wasn’t glad to see him. He trots up, his hooves clicking on the rocks, his head high as if to tell me he never really left, he just went to sleep somewhere smarter than the top of a mountain. I know the answer. He waits for me to go first, then jumps in front of me like he always does. I think about what to do as I walk and decide that the best thing to do is to ask a Norwegian. Who else would know how to stop a reindeer from following you? We walk off the mountain and down a road until we come to a small cabin and camping business. The owner hears the commotion of our arrival and comes out. One look at Theodore Jones and me and he starts laughing. “I know him!” he says. I explain the situation and the man goes back inside to contact the owner. I look at Theodore Jones. He looks at me. We both know the gig is up. I’m happy he’ll head back home, but also a little heartbroken. I sit down to wait. Turns out Theodore Jones works for the International Sami Film Institute. He’s probably a movie star or something. Figures the way he posed for all my pictures like he was auditioning for a live-action Frozen. We can’t reach the owner, but I take down their contact information and wait for Theodore Jonrs to get distracted. When he wanders off down a dirt road, I make a break for it, heading out in the opposite direction as rain begins to fall. An hour later, soaked in the cold rain and trudging down the trail alone, I wish that he’d come running up to make me laugh, to break the weariness of the rain, but I know I’ve lost him. I imagine him crashing through the underbrush nearby, plopping through the bogs next to me, and cutting me off so he can lead. The rain feels colder without him. I think of him hiding in some dry patch under a tree or maybe he made it home and has a nice place to go. A film star like him would have at least a shed, I imagine. Then it hits me, did I ditch him or did he ditch me? We both knew the rain was coming and only one of us is walking in it. Posted in Europe North to SouthTagged backpacking, ENS, Europe North to South, featured, frozen, hiking, Norway, reindeer, Theodore JonesBookmark the permalink. Great stores about Thodore Jones. Do you realize that Theodore means “Gift of God”?